Reece MacMillan, right, with manager Kieran Farrell after victory in his second professional fight. Reece MacMillan vowed to continue learning after keeping up the perfect start to this professional career. The Morecambe welterweight was a four-round points winner over the durable Alec Bazza at Preston’s Guild Hall. The former Skerton ABC man believes on another night he could have made it two stoppages from two fights but was content to simply keep up his positive start in the paid ranks. 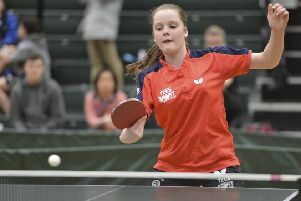 MacMillan, 2-0 as a pro, said: “It was a step up in opponent but I enjoyed it. “I put it on him a lot but he was a tough guy and it was a good test. “I don’t know how he stayed up from some of the body shots. “I could have got him out of there in the third round but he was tough. The 20-year-old from Westgate got the decision 39-37 on the MGM Manchester ‘Night of the Champions’ show and knows there is still more to come. MacMillan said: “It was a tough third round as a I tried to get him out of there. “I maybe put a little too much into it and he edged the fourth. “I could maybe pick my shots a bit more because I really went for it. “If I’d have maybe thought about things a bit more in round three I would have got him out of there. With nearly 100 fans from the Lancaster and Morecambe area out in support, MacMillan impressed manager Kieran Farrell who was in his corner. Having trained at show organiser Johnney Roye’s gym in Preston in the build up, his busy night meant it was Farrell who guided MacMillan through his second pro fight. The Morecambe man said: “Johnney had three title fights so was really busy. “It was his show too so he was running around all night. “It was great to have Kieran there though because he knows how I fight. MacMillan hopes to fight again in September when the new season begins and is targeting a fourth fight before the year is out as he looks to continue to build momentum during his first year as a professional.